Poet Vera Pavlova discusses the unique satisfaction she feels when Steven Seymour translates her poetry. Vera Pavlova is one of Russia’s most successful and prolific contemporary poets. In a career spanning two decades she has published 18 collections of poetry, including “Chetvertyi Son” (“The Fourth Dream”), which was awarded the prestigious Grand Apollon Grigoriev Prize in 2000. She has been translated into 21 languages, but it is only recently, with Steven Seymour as her trusted translator, that her poems are beginning to appear in English. Seymour first heard of Pavlova through her poetry, which captured his imagination. He explains, “I didn’t know who she was or what she was, but I wanted to befriend her somehow or at least meet her.” When they did finally meet – and fall in love – he realized that the few existing translations of her work were very poor, and began working on his own versions. Soon publications such as Modern Poetry in Translation magazine and The New Yorker printed some of these translations, which were ultimately published in a collection of 100 poems called “If There is Something to Desire” (Knopf 2010) which was a top seller among books of poetry in the United States. Indeed, when you read Pavlova’s poetry, you get a sense of just why she has not been tackled by English translators before. Her poems are incredibly dense and powerful, rarely more than eight lines long. Many of them capture one particular instant in time or a burst of emotion poured onto the page, incorporating a wide range of subtle meanings and allusions in a very condensed space. Steven and Vera met on the March 15, 2001 at 19.00 p.m. in Spaso House, the residence of the U.S. ambassador to Russia, after Vera received an invitation to an official function there. When Vera met Steven, she met someone who already knew her poems by heart. After working in Moscow for 8 years, Steven returned to the United States where he continues working as an interpreter. They have been together for twelve years and married for seven. This emotion and intensity is all part of the experience for the pair. “A good translation is the same dream seen by two different sleepers,” Pavlova said. “And we really do have the same dreams sometimes,” Seymour added. They offer the tantalizing notion that she can write a poem in the morning – perhaps after waking from such a shared dream – and have it translated by the afternoon. That her translator is someone with such direct access to her inspiration is surely a relationship unique in the history of poetry. Still, it is a challenge that he clearly relishes, describing the process of fitting together each element of his wife’s poetry as, “Like doing a crossword puzzle.” Following on from the success of “If There is Something to Desire,” Seymour has translated another 300 poems for a new edition, although no publication date has yet been set. 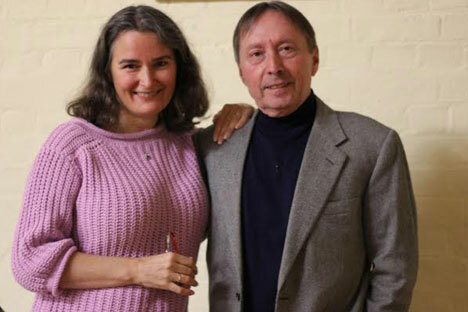 The pair has just completed a successful visit to the Aldeburgh Poetry Festival in the UK, which culminated in three poems being published in the Times Literary Supplement. In the longer term, Pavlova intends to write out her entire canon of poetry by hand. When Seymour translates these, he will be re-reading the poems that first drew him to Pavlova. there will be something to regret. there will be something to recall. there was nothing to desire. Find out more about Russian literature in our Special project READ RUSSIA!